This interactive presentation contains the latest oil & gas production data from 19,780 horizontal wells in the Eagle Ford region (TRRC districts 1-4), that started producing since 2010, through October 2017. The Eagle Ford recovered a little further in October from the impact of Harvey in August, to over 1.06 million barrels of oil per day. Unfortunately the quality of the Texas RRC data has deteriorated in recent months. There are numerous wells that started producing in the 2nd half of last year, but which still are not yet reported on the lease, or on the oil proration schedule. The result is that the production from these new wells (which is reported!) is now allocated to the other existing wells on these leases, and this causes the appearance that legacy decline has been reduced in recent months. This is especially the case for EOG. In the coming month I will look for additional ways on how to deal with these inconsistencies. In the “Well quality” overview the production profiles for all these wells are available. There are not many basins where well productivity has changed so little in recent years as the Eagle Ford. That makes the new well results rather predictable. The ‘top operators’ tab shows the operated output of the 5 largest producers. EOG is with more than double the production compared with the number 2 clearly in the lead. In this “Ultimate Recovery” overview the relationship between production rates, and cumulative production is revealed. Wells are grouped by the quarter in which production started. Recent wells peak higher, but follow very similar decline paths as earlier wells. Wells that started in 2012 have now reached a production rate of about 20 barrels of oil per day, and are just shy of 150 thousand barrels cumulative production, on average. In addition, they produced roughly 0.6 Bcf of natural gas. Using the ‘Productivity ranking’ overview, I found that of the large operators Devon and ConocoPhillips have the best well results, as measured by the average 1 or 2 year cumulative production. Next week I plan to have posts on Pennsylvania, and all 10 covered states in the US. This doesn’t seem like a very impressive trend for Eagle Ford production. 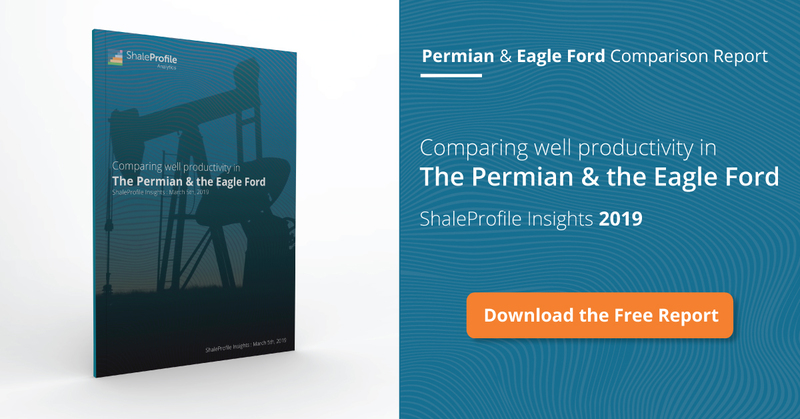 Do you subscribe to the Mark Papa view that the Eagle Ford has mostly exhausted its sweet spot inventory and cannot grow production significantly from here, even in a much higher oil price environment? The trends in your data would seem supportive of this view. And Goehring & Rozencwajg contend that Bakken growth in late 2017 was the result of DUC liquidations. If those 2 points are true, that would leave the Permian and the emerging Scoop/Stack as the key basins for driving the incremental US shale production growth from here. Any insights on the productivity of the Oklahoma acreage? I am not expecting significant growth in the Eagle Ford in the near term. Well productivity hasn’t improved as much here as in other basins. However, it also hasn’t decreased yet, and therefore I’m cautious with predicting where production is headed. In the Bakken I don’t see a significant decline in DUCs (see the ‘Well status’ tab in the latest ND presentation, and select DUCs only). Regarding Oklahoma: the data is hard to work with, as there is no single reliable, complete, source. but I’m working on a solution. Not yet clear when I will be able to share this though.